Take your most popular tweets and Facebook posts, or the ones you feel most passionately about, and use them to develop blog posts. You don’t have to write three pages; you don’t even have to write four paragraphs. Seth Godin is one of the most successful bloggers in the marketing world, and he writes in two- to three-sentence paragraphs. He’s a master at expressing ideas that are thought-provoking and easy to read. People are pressed for time these days and content can be overwhelming, so make it valuable and easy to read. Another way to get ideas is to comment on the things you read, such as other people’s blogs and newsletters, media publications and anything else relevant to your business. You’re already absorbing the content and you probably have opinions when you’re reading it, so go ahead and comment on those blogs. One benefit of commenting is that people will start recognizing your name; another is it gives you material for a blog post. Use Meddle to help with your blog posts. We live in an age of information overload and short attention spans. When it comes to capturing your audience’s attention, take full advantage of every chance to communicate your message in a way that they’ll engage with! The best way to gain and keep your audience’s interest is by using an effective visual content. Visual social media platforms like Pinterest can be a fabulous traffic source if used correctly. When designing Pinterest graphics, make sure your readers know “what’s in it for them.” Take a look at the images below. They’re two separate styles of blog graphics for the SAME article. The top photo makes sense when it’s seen on the blog itself. However, when you take the photo away from the post, there’s no frame of reference for it. Add a title that tells viewers exactly what they’ll get if they click on the pinned graphic. The bottom graphic, on the other hand, uses text to tell viewers exactly what they’ll get if they click on the pinned graphic. Always include the title of your blog post on your graphic. That way, when you pin it to Pinterest, users will have a frame of reference and want to read it. Over the last year, Facebook has been slowly making algorithm changes that have limited the number of people who see a page’s Facebook post. Pages can use these algorithm changes to their advantage by thinking of their page as a user resource, rather than a promotional tool. Build a page your customers would enjoy and then use that platform to delight them. Deliver posts that educate, entertain, inspire and inform to reach a wide Facebook audience. How much time do you spend crafting blog posts? Sending emails? Sitting in meetings? Even if you have a good idea of where you’re spending the bulk of your time, you may often feel there simply aren’t enough hours in your day. Getting a handle on time management is a huge challenge for business owners. Try a time-tracking tool like RescueTime to improve your daily productivity and devote more time to the areas that need it most. RescueTime is a great time-tracking tool. For example, let’s say you spend a great deal of time interacting on Facebook and Twitter, but you’re not seeing a lot of results. Meanwhile, your email marketing campaigns are intermittent at best, although you know the results are there for the taking. Adjust your daily schedule so you spend more time on email marketing and see if it drives more sales. Remember, digital marketing depends on the trifecta of social, blog and email. If you neglect any one of them, your entire strategy could suffer. However, give them each a little love, and you might just see explosive growth. It’s all about finding a balance that works for you and your business. 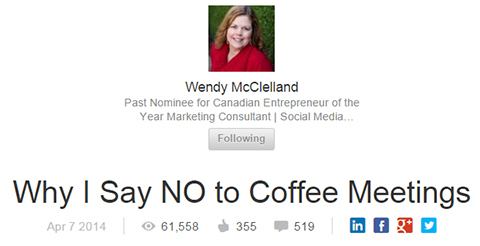 For example, after Wendy McClelland added her third post, Why I Say NO to Coffee Meetings, she received more views, likes, and comments than she ever could have expected. Wendy McClelland’s post, Why I Say NO to Coffee Meetings. Wendy’s following is just over 1,500, but this published post got more than 61,500 views, 350 likes, and 500 comments! 60,000 people outside of Wendy’s network were exposed to her and her work. While most posts will not achieve such extreme reach, all posts have the potential to reach new people. Each time you publish, all of your connections and followers will receive a notification. The post also has a chance to be included in the email LinkedIn Pulse sends out to its members with suggestions for posts that might interest them. 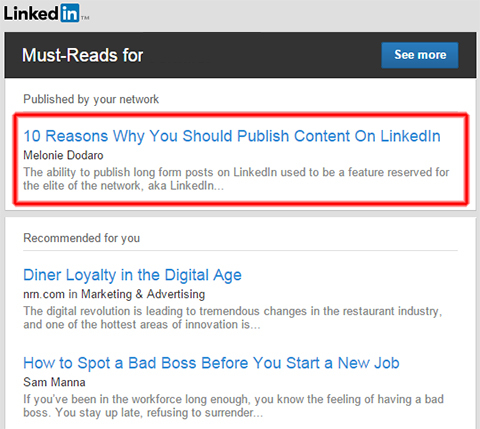 LinkedIn Pulse sends out an email of noteworthy and recommended posts. To increase your chances of success with Publisher, create professional-looking posts that address the needs and pain points of your audience. Make sure you avoid adding spammy or promotional information. Post valuable content that your network will share with their connections and your reach will grow even more. Unless your company is a big brand, it’s unlikely your customers are scattered across multiple social media channels. Therefore, to make the most of your limited resources, find the one channel that is densely populated with your ideal customers and inhabit it like no other. If you run a small business, creating or curating content can be relegated to the back burner. The problem is that an erratic publishing schedule can alienate your audience and break trust. There’s a way around this. 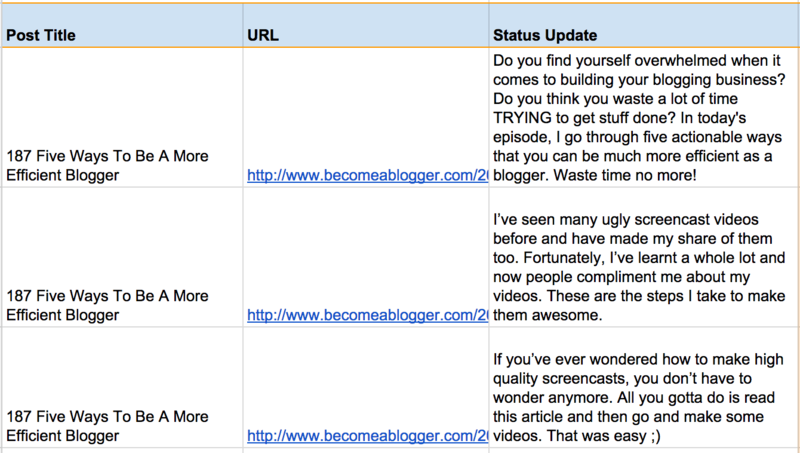 Schedule a baseline of curated content. While there are a number of tools out there that can help, lately I’ve been choosing to use Hootsuite’s new Suggested Topics under its Publisher tab. 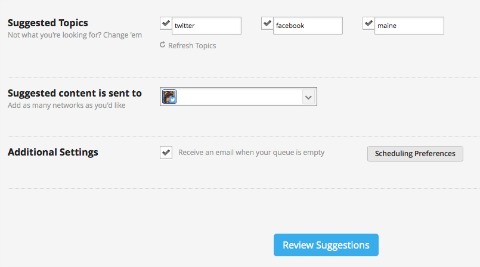 Use HootSuite’s Suggested Topics tool to find curated content. Select up to three topics of interest, then let Hootsuite find content that’s relevant to your audience. Let Hootsuite find content that’s relevant to your audience. As I mentioned, this is baseline content. If you want to rock your social media marketing, you still need to create and curate your own posts, as well as engage with your audience. However, this tool lets you stay in front of your audience even when you’re making sales calls, writing proposals and brewing that second pot of coffee. One thing that holds many businesses back from actively posting on social media is having to come up with ideas for what to post. When you batch content and social media update creation, it’s much easier to come up with interesting ideas for status updates relating to that content. Whenever you create a piece of content (article, podcast or video) for your blog or website, come up with a list of 10 to 20 social media posts at the same time that can be used to promote that piece of content. This same concept will work for your product pages, sales pages or any other piece of content you want to promote. Batch social updates as you create content. Once you have a list of social media updates, add the updates to a spreadsheet to keep track of them all in one location. This can be a simple spreadsheet that includes just the update and a link to the content, or it can be a more elaborate one that tracks all of your content and social media updates for multiple networks. This will save you a lot of time over the long run. Also, you build a library of tweets and status updates that you can use for years to come. Whenever you need to schedule some updates, just come back to the spreadsheet, create a .csv file, import it into a program like Hootsuite and you’re good to go. By publishing new and previously published content on LinkedIn, you can grow your audience and network while increasing your status as an expert. Through this open publishing platform, your original content becomes part of your company’s profile, is shared with your trusted network and has the ability to reach the largest group of professionals ever assembled. This post gained more visibility when it was picked up by editors. 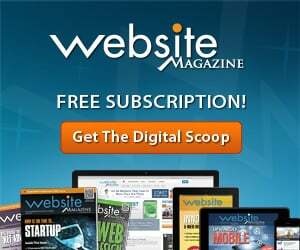 It takes a lot of time and effort to attract visitors to your website. When you do attract relevant visitors, it’s important to maximize the potential of that visit even after they leave your website. There are now great retargeting options where you can follow your website visitors to other sites like Twitter and Facebook, and encourage them to take further action. For example, to target your website visitors on Facebook, display “page like” ads and encourage them to become fans. This currently costs us 15 cents per fan. In return, we get a relevant fan and another place to reach our audience. 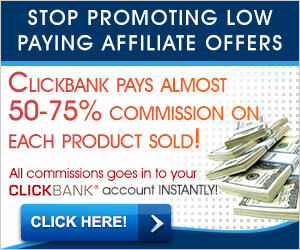 Website owners can target past website visitors with ads like this on Facebook. Your potential customers don’t see all of your communication, but with good marketing tactics, you can improve your chances of showing up in their social streams! This entry was posted in Social Media Marketing and tagged AffilliateMarketing, AmazinGrape, AutomaticMarketing, grape, inbound marketing, markethive, Roy Revill, social media marketing tips on August 8, 2016 by Roy Revill. Are you up to date with the best social media tips and tools? While “if you build it they will come” is a great line from a movie, it’s a terrible marketing plan. To succeed on the Internet today, you have to create content that ignites and engages an audience. However, if you are a new blogger, you should probably spend more time developing an audience than creating your content. Here are three easy but overlooked tactics you can use to build an audience on Twitter, which is arguably the best platform for this. Use Twellow to find and follow targeted users in any category. There are many apps to help you find new followers, but one of my favorite places to find targeted followers is Twellow. This useful and free site is like the yellow pages for Twitter, and you can find and follow targeted users for every category, industry, and interest imaginable. Use specialized Twitter search prompts. Unlock the basic search functionality right on the Twitter screen by learning a few of the specialized prompts. This is one of the most powerful market research tools available. Follow this link if you want a complete tutorial on Twitter search. With these tactics, you can expand your audience to reach people who are seeking your products and services. Most businesses analyze the effectiveness of their social media after they publish. 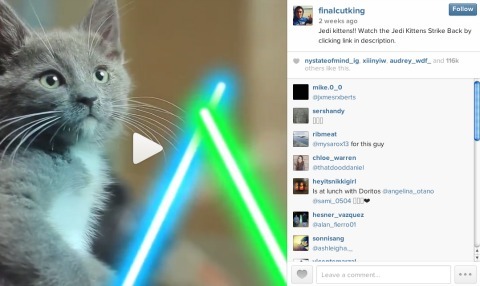 Now, there are tools available to analyze data for content curation before you post. Here’s how to use Buzz Sumo to leverage the data of what has already been successful in terms of social sharing. First, enter a keyword that is part of your social media content strategy. BuzzSumo will provide you with a list of the top-performing content in terms of social shares according to your keyword. BuzzSumo shows you the top-performing content in terms of social shares. Next, because some content performs better on some networks than others, you can curate content by social network. Armed with this data, you can increase the effectiveness of your content curation by publishing content that has a greater chance of success on a specific network. You can also filter content by type (which is ideal if you’re looking for videos or infographics to curate) or filter by time period. The latter lets you find content that’s been most popular in the last 24 hours or evergreen content that’s been popular over the last year. The choice is yours! Visual content can act as a “gateway” to more valuable content. When planning visual content to post on social platforms, think in terms of how it can drive traffic back to your website, products, and services. 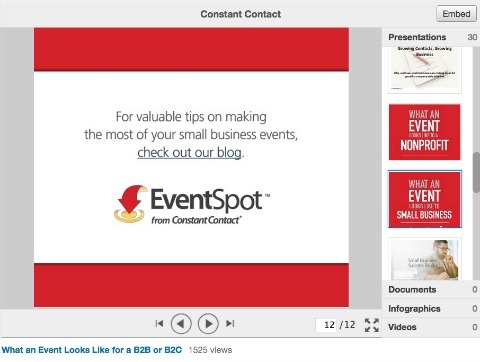 For example, in this SlideShare deck, Constant Contact included a link back to a resource page listing multiple blog posts with related content. When fans click through, they arrive at a page of value-added blog posts relevant to the SlideShare topic. Link a short video back to your website from your YouTube Account or from your Instagram profile link and make sure you provide expanded content around the video. For example, Final Cut King drives his fans on Instagram back to longer content on his YouTube channel by asking them to click the link in the description of his Instagram account. Final Cut King uses a call to action asking people to click on the link in his descriptions. Creating the best possible tweet has never been more important. Adding visual appeal to your tweet is a very smart way to get your most important content noticed. You can add up to four images per tweet or one fantastic image if you want. The choice is yours! To add multiple images, use regular Twitter. This isn’t available on any of the third-party sites. Here’s an example of a tweet with multiple images on Twitter. Over the past two years, I’ve moved to adapted written content for multiple platforms, like YouTube, to increase my reach and visibility. We turned List25 articles into videos. Changing content formats doesn’t have to involve just videos. You can also convert snippets from your existing articles into images—which tend to have better reach on Facebook. These images allow you to leverage the power of social networks such as Pinterest and Instagram. Here’s how I shared a Tip of the Week image on the WPBeginner Facebook page. Convert blog posts into images for your Facebook page. Have you written a lot about one specific topic on your blog? Why not combine those articles into an ebook and use it to build your email list? If you’re not changing any content format to improve your overall reach, then you aren’t maximizing the full potential of your content. So many organizations feel overwhelmed by the need to create content for every social media channel on the planet. Or worse yet, many brands create one type of content and then blast that content onto every social platform. If that’s you, you need a social media channel plan. Most likely, your goals are different on each social platform. Since that’s the case, the content you develop for that platform needs to be different as well. Here are the components for your channel plan. And this is exactly why content marketing isn’t easy. But if you leverage a social media channel plan correctly, you’ll be able to double down on the channels that work for you and be realistic with your resources on the other channels. One of the best ways to grow your following and increase engagement on social media is to be there consistently. The first step is to put the right systems in place to keep your posts relevant, interesting and valuable for your audience. Enter Edgar. I found out about Edgar a couple of months ago and love the platform. Edgar allows you to create your own content categories so you can keep track of the specific types of posts you’re releasing; this ensures you don’t overwhelm your followers with the same types of posts over and over. Manage content categories and avoid repeat posts with social media scheduling tool Edgar. You can also schedule repeat posts indefinitely, so your content schedule never runs dry. Plus Edgar allows you to upload custom images for your Facebook, Twitter, and LinkedIn posts. As you build your content library, update your schedule with the categories you want to release and when. Then let Edgar take care of the rest. 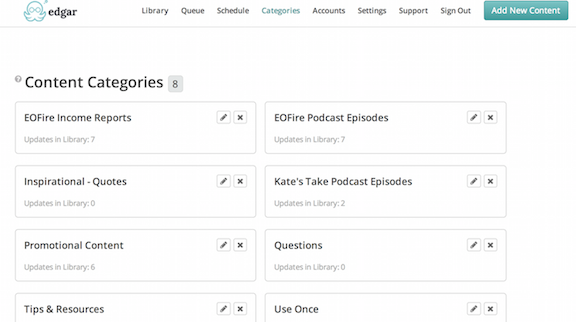 Build a content library, update categories and schedule posts in Edgar. Leveraging a social media scheduler like Edgar has saved me time, helped me grasp the big picture when it comes to my social media marketing strategy and allowed me to stay on top of my game when it comes to delivering valuable content to Fire Nation. Social media success is so often about having a conversation with the right people. If you already think in terms of building segmented lists, then you may appreciate knowing that you can effectively list-build on Google+ in many ways. Use a private community alongside regular Google+ Hangouts On Air (HOA) events, so you can host a dedicated, private experience while having conversations with the right people. Around a third of community members watch the event within a day. About 8 to 10 community members also join the event as participants. Unlike with public communities, when you initiate your event within a private one, the members receive an event invite/notification. This is a perfect way to break through the noise and reach the right audience. 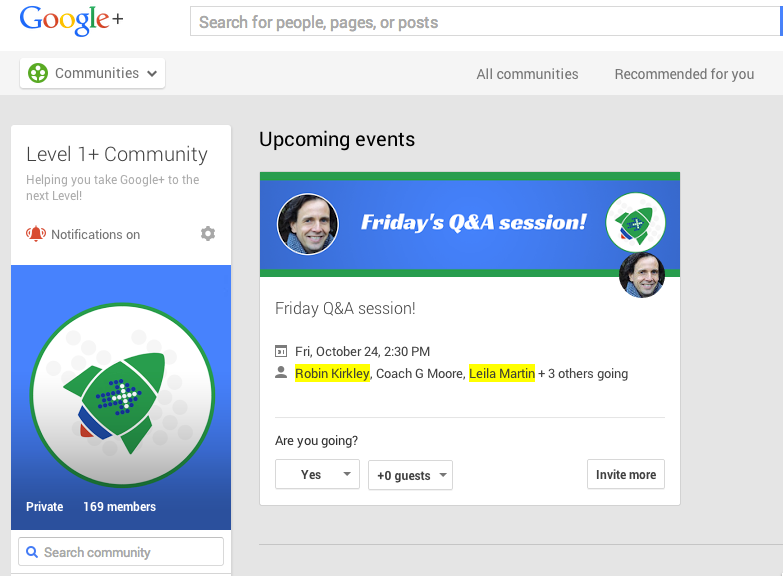 Find the right audience by combining private Google+ communities with HOA events. In both scenarios, the event will be listed under the Event tab, as well as on the right-hand side of the community. Selling is increasingly personal, so face-to-face time with your community makes a huge difference. Also, the ability to quickly give them access to links/resources results in a great customer service experience. If you want to be successful with your social media plan, stop random acts of hashtagging and use a good hashtag to tie all of the pieces of your campaign together. Use a hashtag that is easy to spell and easy to remember. To make sure your hashtag isn’t already being used for something else, check for it on all channels prior to using it for your campaign. Once you create your hashtag, follow and join the conversation! To follow your hashtag, use sites like Social Mention and Sprout Social. Use TwiPho for searching images on a hashtag. 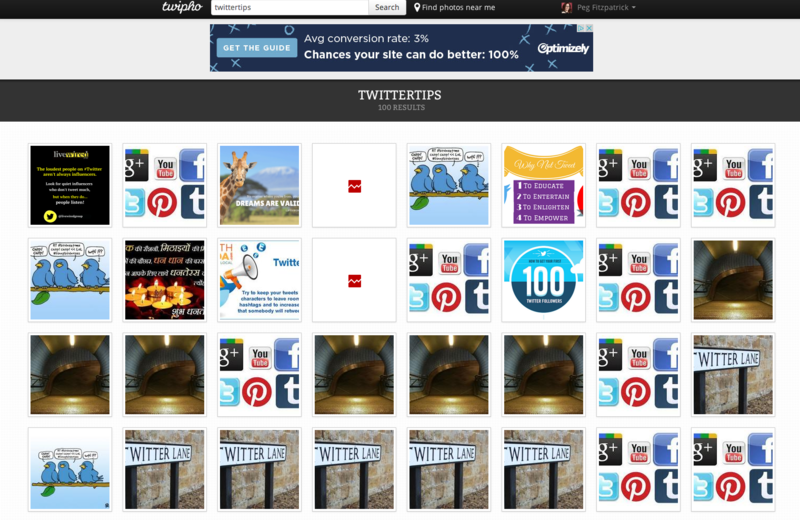 TwiPho allows you to search Twitter for photos and images on a hashtag. I’d always believed Pinterest is best for organizations that have something visual to show: fashion, food, sports. But a friend recently proved me wrong. An organization that provides software as a service to a very narrow audience tested pinning their blog posts to Pinterest. In some cases, the images from the blog posts were original—infographics, their product in use or PowerPoint decks—and in others, they used a paid Shutterstock account. They built boards based on their brand personas, representing five different segments, and got to work. This entry was posted in Social Media Marketing and tagged AffilliateMarketing, AmazinGrape, AutomaticMarketing, ChuckReynolds, grape, inbound marketing, markethive, Roy Revill on August 8, 2016 by Roy Revill. AmazinGrape is simple yet effective! As a supplement , it is made from only the most premium skin and seed from the Muscadine Grape, which is where the most antioxidants are. As a business, AmazinGrape offers a premier website allowing your potential customer/business owner information such as research, links, conference call and all the tools you need to engage their intellect to help them make the best decision ever! Plus, a back office vital to your business complete with an email responder, genealogy of you upline and downline, Ordering, commissions, and more..
Paul Hopkins founded AmazinGrape in 2009. He bases everything on biblical healing and nutrition. He wrote a book as well about nutrition in America. He is a practitioner of herbs and is not nor claims to be a doctor. Benefits range from the ability to slow down aging, flood your system with antioxidants, a potentially powerful cancer fighter, reduces inflammation, encourages heart health and lowers blood sugar, as well as aids in weight loss! AmazinGrape is based on 4 simple goals and 4 easy steps. Yes, Basically, it is a 4 step system. It is a matrix based marketing system which pays up to 50 percent on first-time orders. As well, as 28% on your first level. There are more facts and details that you can find for yourself, but, that above review will do for my first announcement for now. This entry was posted in Product and tagged AmazinGrape, grape, MuscadineGrape, supplement, supplements on August 5, 2016 by Roy Revill. The Muscadine Grape has 20 pairs of Chromosomes. All bunch grapes, table grapes and wine grapes have only 19 pairs. The Muscadine has more than 44 times as much Resveratrol (anti-aging) as red wine (vinefera) grapes naturally, and the highest ORAC rating in testing by Brunswick Laboratories. If you are looking for a natural way to reduce muscle and joint pain, help enhance cardiovascular health and a healthy digestive system, you may find just what you are looking for in Muscadine Grapes. Known as America’s first grape, Muscadine Grapes can be found in some Southeastern States, because of their thick and strong skin, they are well adapted to hot humid climates where other types of grapes don’t prosper. Unique in nature the Muscadine is the only grape with extra chromosomes. In order for your body to reap the full health benefits of the Muscadine Grape, taking a health supplement that uses the fruit in its entirety is highly recommended. Resveratrol is the ingredient in red wine that made headlines in November when scientists demonstrated that it kept overfed mice from gaining weight, turned them into the equivalent of Olympic marathoners, and seemed to slow down their aging process. Few medical discoveries have generated so much instant Buzz. This entry was posted in Uncategorized and tagged AmazinGrape, grape, Grapes, nutriction on August 5, 2016 by Roy Revill.